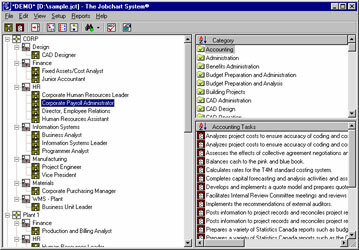 If you haven't already done so, download and install the Jobchart System® software on your computer. Then simply follow along to see how the system works! When you start the software, you are presented with a secure login screen that lets you enter a unique username and password combination. In addition, you can specify to open the database in Exclusive mode for archiving or other maintenance. 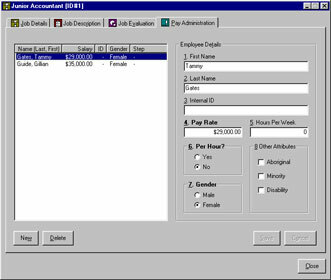 Using the new Administration tools, unique users can be added with customized access to information in the database. 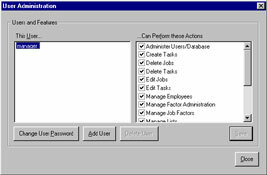 For example, a user could be created to create and modify Task Lists, without access to confidential employee information. 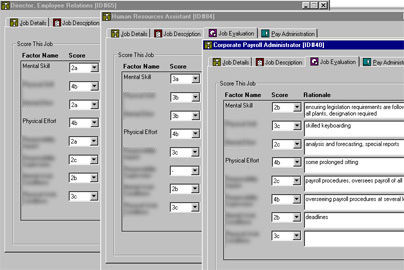 The main screen is broken into two sections, with jobs on the left, and task categories and tasks on the right. You can customize how the jobs are organized on screen to help you work with specific departments, locations, job titles, and more! Simply click the hammer button to create a new job, or double-click any existing job to edit its information. 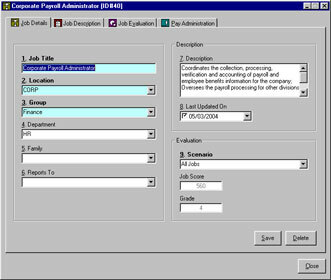 Each job contains job details, a job description, job evaluation data, and pay administration data. 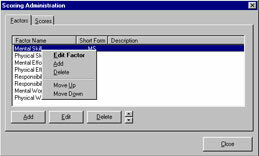 A powerful spell-check engine is included in the software to eliminate typos before they are entered into the database. Users can even maintain custom dictionaries with commonly used, industry-specific words that should not be flagged as misspellings. Tasks (duties written using action words) are organized into categories at the right side of the screen. Single or multiple tasks can be added to any job by simply dragging the tasks to the job title or job window. 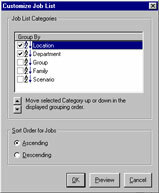 A right-click menu allows quick access to common tasks, such as viewing all the jobs that perform the selected task! You can open dozens of new jobs simultaneously (limited only by your computer's available memory), which makes the process of job evaluation simpler, faster, and more reliable. 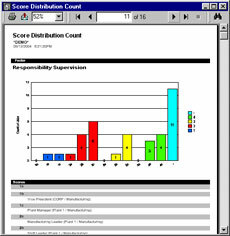 Any points-based job evaluation system can be easily integrated into the software, or simply use the Jobchart System®! Easily add your logo to all reports in one step! View, export, and print a variety of prebuilt, customizable reports, such as Job Descriptions (Task Lists), Compa Ratios, graphical Score Distributions, and more! Custom reports created for your specific needs can be ordered from our web site and seamlessly integrated into the software. Quickly enter employee data, and drag-and-drop employees from one job to another! Multinational customers can create separate custom currency formats (Euros, Pounds, etc.) for each business unit. Translation efforts are ongoing; ask if the software is available in your language!